We have made this our Melbourne home for the last few years....meets all our needs and staff are Great......thanks everyone.......always enjoyed our stay and have become hooked on Bergerac just round corner. A very comfortable hotel, reasonably well located, very clean and comfortable. As ever a lovely experience. Love this hotel. Great value, great service . Lovely food at breakfast and especially the dinner. Special mention to the waitresses at breakfast and dinner. Very friendly ! A wonderful stay. We look forward to returning in the near future. Will certainly recommend hotel to friends and family. So convenient to station, good restaurants and the shopping center. Nothing too much trouble for staff. We had a very enjoyable stay at the Alto. The room was very comfortable, the towels luxurious and the breakfast as much as one could expect. All in all a great stay. This was my second stay at the Alto. We enjoyed it very much, I liked the fact that a full breakfast was provided and that we could also have dinner at the hotel. Amy, one of the servers in the dining room was exceptionally pleasant.Thanks to all of the staff for the warm welcome and for their attention and help. We had a good time. We are budget people always looking for accommodation that "punches above it's weight". Found the outlook a little disappointing ie looking out onto rooftop air conditioners and having to keep the blinds down as we felt everyone else was looking in at us. Best thing? - the hollandaise sauce! Only a short stay, , Easy access for where we needed to go on Sunday. Breakfast menu was excellent and good value for money. Comfy beds. I thoroughly enjoyed my stay at Alto Hotel On Bourke.All of the staff were very friendly and helpful.It was within walking distance of all the transport and also the shopping areas.I would definitely recommend it to my friends. If you want me to I will make 2 small complaints,although they did not spoli my stay. I found the toilet paper in the room too rough(maybe I have a sensitive b**) and also coming from a hot country I did not need air conditioning in my room I needed a heater as i was cold at night .The breakfasts were ample and tasty.I tried many different dishes on the menu and they were all good. Maybe the dining area was too small as I found I needed to get there early at weekends or I had to go back an hour later as it got crowded,but again it just meant I had to change my plans.I'm afraid I did not take note of the names of the reception staff,but I found them all very helpful even. if I was a nuisance at times.Carry on the good work. A very satisfying stay. Very comfortable hotel in a fabulous location, with lots of thoughtful touches. Tasteful but not over the top or ostentatious. Great location, lovely room and loved the fire and library. Very comfortable, clean, friendly staff, great breakfast and well located. We wished we could have stayed longer. Comfortable though the petite queen was a bit too small for the 2 of us and all our film equipment. Our 1 Bedroom Spa Apartments have a large bath that also has spa jets. All other rooms have a walk-in shower. Front desk extremely friendly and obliging (particularly Grant? the dude with shaved head) and the young girl with long hair waiting in the dining room was lovely and friendly. Service extremely good, room sizes were great and the dispensers in the bathroom and shower stalls were fabulous! Lovely soft towels and comfortable beds. Breakfast was very very good, more so than the evening meals. Overall a very good experience and will recommend. Amazing & brilliant hotel. I travel a fair amount for work & have stayed in many different hotels. I am SO glad I have discovered the Alto - this will definitely remain accommodation of choice & I have already started spreading the word to look no further than the Alto when in Melbourne - thank you! My partner and I's experience was great. The staff were very helpful when it came to directions and suggestions of places to go and things to see. The room was exactly what we were expecting and very functional overall, and the room had FOXTEL! That was a very pleasant surprise and included the movie channels. This was my very first stay at the Alto and I will definitely stay there again. And the breakfast was AMAZING! I really enjoyed our stay, the room was just lovely. It was great that a recycling bin was provided, that the coffee provided was Fairtrade, and that you offered the GreenFleet option when booking. I appreciate things like this when staying in hotels. Great! We had a wonderful weekend. The whole hotel was clean and fresh. The staff were friendly and helpful. We will stay again! Have never been disappointed with the Service and friendly staff. Hubby loves his freshly cooked breakfast. Very convenient for airport transfer,footy (even when at Geelong ) and getting around. Love that the tram is at the door. Perfect for my requirements, close to everything and service was excellent. Thankyou for the upgrade, I will probably prefer the king room next time now that I have stayed in both. Love the recycling, the soft towels, great pillows and a real hair dryer! Very satisfactory, would stay again. This was our second stay within 2 weeks and the standard of service was exactly the same. Highly recommend the Alto. Great location close to Southern Cross Station. Tram outside door. CBD within walking distance. Very comfortable and well equipped rooms. The hotel was a great place to stay, perfect for our group of friends, sharing the 3 bed apartment which was well equipped. This was our 2nd stay in a month, no hesitation booking again. Convenient for arrival by train (the first time) and airport bus (2nd time) staff are lovely, breakfast great. Disappointed that the restaurant wasn't open on Sunday night but we understand why. Will book with you again if coming to Melbourne and recommend to others. Read the history this time and love the lead light and floor mosaic. Very good value for money stay in a quiet location within walking distance from the city centre. Friendly staff at the front desk, breakfast room and even the maids. Kitchenette was very useful. Excellent stay at the hotel. Friendly and informative staff, clean rooms that were well equipped. Great location and love the gym that we can have access to. Next time, I will try to borrow the smart car! A highly enjoyable experience. This was the 2nd time I have stayed and will again in the future. 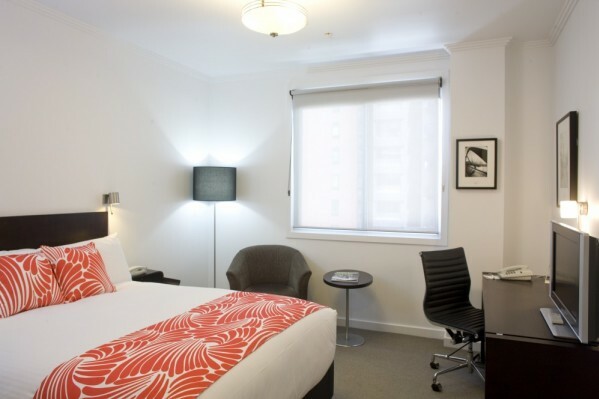 Very enjoyable stay, good location with trams, trains, & easy walk into CBD. Enjoyed the choices at breakfast. The room was very clean & comfortable. couldnt have asked for anything more...except a pool!! We certainly will book with this hotel in future stays in Melbourne. Location perfect to the RailwAy Station and extremely quiet for sleeping. The restaurant has excellent food, service good and limited people makes it just perfect.